Zedruu the Greathearted is not only our commander, but also gives the deck it's spirit. 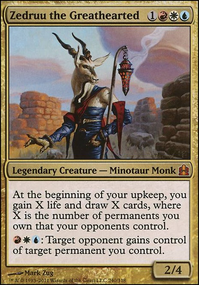 Zedruu is a 2/4 Minotaur Monk that obviously wants to be a goat. While that is definetely unique and awesome as hell it honestly doesn't matter at all... What does, is Zedruu's, also very unique ability: You'll gain X life, and even more important, draw X cards, where X is the number of permanents YOU OWN, that YOUR OPPONENTS control... sounds weird, and it is indeed. Zedruu also comes with her very own "gifting" ability: So you may pay Jeskai to gift your permanents to an opponent any time you could play an instant. While there are many decks out there trying to abuse this ability to gift really, really bad stuff ( Pyromancer's Swath I'm looking at you) to their opponents I've made the experience this usually ends in the table killing the lovely goatlady first... --> not fun... But Zedruu still wants to gift stuff, it's as easy as that... Always being the gentleman I am of course I heared her call and opened my mind for Zedruu's Enlightenment: There are a lot of cards that have a global effect, affecting the gameplay in the same way, no matter who is in control of them ( Meekstone , Divine Presence , Howling Mine ). While these make formidable gifts, not only helping our opponents but ourselves as well (while also giving extra value --> Zedruu's ability) they usually aren't cards our opponents want to get rid of --> they stay in the game longer. The Goat's ability also allows us to help out other players, for example if they are manascrewed by gifting them a precious land. Usually they will repay their depths somehow, even if that only means not being attacked by them for a few turns. This deck wants to play political and Zedruu's ability helps a lot with that. While you should be able to play the deck without the commander being on the battlefield, the mother goat offers a very delicate way to draw cards/gain life right there in your command zone. You should be cautious though, as drawing 3-4 extra cards with Zedruu might attract unwanted attention from your opponents. Keep the number of your Zedruu-triggers low till the lategame, when you are able to fend of what they might be throwing at you... As long as you keep your triggercount low enough Zedruu shouldn't be a target of your opponent's removalspells at all, but to protect our lovely Goat from the casual bordwipe or the black Grave Pact -player you have Gift of Immortality in your decklist, tutorable with all three of our tutors if it's needed. Darksteel Plate is also a viable option. Our first goal when playing Zedruu is to build up our defenses to stay alive. We don't play many creatures, and most of which we have aren't the best fighters. Zedruu's monastery is a peacefull place and war needs to be avoided whenever it is possible! (We don't want our little, peacefull monastery to be ransacked by filthy goblins, don't we?). In the early game cards like Propaganda or it's white counterpart Ghostly Prison should be enough to prevent our enemies from attacking, while cards like Meekstone , Maze of Ith and Divine Presence prevent our opponents from dealing early points of damage aswell. Righteous Aura is a newer addition to the decklist and seemingly prevents enemies from attacking you on its own as long as you have a white mana at your hands... It's very important for us to know when the right time to tighten your "lock" has come, as a to early Sphere of Safety + Enchanted Evening lockdown might cause your opponents to panic and team up on you. Build your pillowfort wisely, stone for stone and only as much as nescessary. 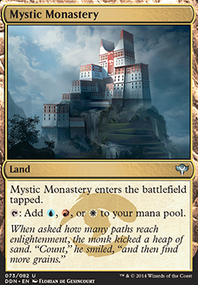 If the tide has turned allready and you are being attacked frequently it might be the time to close the gates of the monastery shut: Glacial Chasm is an amazing card on it's own, but becomes even more amazing if paired with Solemnity , avoiding the age counters and the lifeloss they are causing... I've allready mentioned Enchanted Evening and Sphere of Safety , which are making it very "costly" for your opponents to attack you. Finally there is Solitary Confinement , which acts as a complete lockdown on it's own. Zedruu's drawtrigger, aswell as cards like Temple Bell or Rhystic Study are helping out here quite well. As I've said before, one of the main goals of the deck is to act political, but what exactly does that mean? And what has group-hug to do with it? There's no need to despair because I'll explain it to you right now: When playing politics, simply imagine yourself being a high ranking politician, candidating for becoming the next president of Zendikar... or Lorwyn... where the hell does Zedruu live?! If you want to become the president, you will need the people to vote for you. How to do that? Well, offer them something! And that is exactly what Zedruu-politics is about: Of course you don't really want to become the president of Zendikar (It's pretty dull anyway with all the Eldrazi venturing arround...), but certainly you want your opponents to act in a certain way. Political offerings are the key here: You don't want the guy with the big, evil looking creatures to attack you? Then give him the Mana he so desperately needs, or help him by drawing some more cards by letting the Temple Bell ring... There are plenty of options inside the deck to help making your opponents your friends. This is what magic is all about, atleast till the lategame... but that's another story. Below I'll list some of the political cards and their purpose in the deck: Cards like Howling Mine , Mikokoro, Center of the Sea or Open the Vaults are helping out everyone on the table, making you look like the friendly, nice goatlady from the neighbourhood you are. Cards like Humble Defector or Rainbow Vale are perfect by forging alliances with target players. Forbidden Orchard gives an opponent of your choice a neat little spirit token, that might act as a usefull blocker or be sacked for mana. When forging alliances this might also help building an army against the table-archenemy while giving you rainbowmana at the same time. The famous Maze of Ith cannot only be used for your own protection, but also to safe one of your opponents from dying of infect-damage. He surely won't forget that and be your friend from there on. If you wan't to spread some bad blood between your opponents, use Bitter Feud to make them kill each other (You can choose new targets by using Venser, the Sojourner on the feud...). Another option to accomplish that comes with Crown of Doom , which makes your opponents the more attractive target. Even the decks removal has got some politics to it: Spells like Oblation get rid of a permanent, sure, but never cast them without making clear how sorry you are and that your opponent atleast may draw some cards as a refund... Playing Zedruu you are the friendly goatmother your enemies don't need and optional don't want to attack... Make sure everyone comprehends that! The Illusions of Grandeur are one of the most iconic cards in every Zedruu-deck. As with the Transcendence it works quite well as a neat little gift, healing you for 20lifepoints ( 40 if the Alhammarret's Archive is allready on the board) as it enters and costing your opponent the same amount as soon as it leaves the battlefield, and that it will, regarding its cumulative upkeep. Similar to the Transcendence we can return the Illusions to our hand by using Venser, the Sojourner . Cards like Oblation or Chaos Warp can also be used to shuffle the Illusions back in your library and saving it for later, if Venser is'nt at hand. This is more of a "combo-win" by casting Enchanted Evening , turning all permanents into enchantments, then casting Austere Command , wiping the whole board out of existence. Just make sure you've got enough mana to cast your Boros Charm , so all your stuff has indestructible at instant speed, while everyone else has got nothing left. While this doesn't technically win you the game, you sure will win in the next few turns, as no one will be able to catch up with you in time. Also most of the time the table simply scoops it up, as you winning the game is more or less a sure thing allready. While Mindslaver might be powerfull on its own, there is a way to lock a single player out of the game (Maybe more if you have plenty of mana due to Mana Flare or Serra's Sanctum + Enchanted Evening ). The only things you need are of course the Mindslaver , the Academy Ruins aswell as 13 mana. This allows you to repeatedly cast/ sack the mindslaver and returning him to your topdeck with the academy ruins. This lockdown of course is exspecially powerfull if there is only one opponent left, allowing you an easy win. Another option for the lockdown involves the Forbidden Orchard , the Trading Post aswell as Zedruu the Greathearted , your lovely commander. At first gift your orchard to your opponent with Zedruus abillity, then cast/sack Mindslaver to take his turn. During your opponents stolen turn, use the Forbidden Orchard to give yourself a spirit-token, then sacrifice it to the Trading Post to return the mindslaver to your hand. As the deck allready lists quite a lot enchantments, the Serra's Sanctum has been an obvious inclusion for the deck. While it usually taps for about 3 to 6 white mana, what allready helps us out a lot, we can rapidly increase the amount of mana by casting the Enchanted Evening . Suddenly all permanents on the battlefield are enchantments in addition to their other types. This means that the sanctum will tap for X white mana now, where X is the number of permanents on our board. This usually means about 15 to 30 white mana for our cause (Insert evil goat-grin here). The main reason for this update was to revise the role of the Sunforger in this deck. While the lovely hammer was doing great work as soon as he hit the battlefield, it sadly didn't hit for to many times at all... I needed to fit in some cards to help me finding the hammer in the deck: Steelshaper's Gift can find the hammer as early as turn 1 (can also be used to tutor up Darksteel Plate ). Open the Armoury fulfills a similar purpose (can also be used to find the plate and Gift of Immortality ). I also put in some new targets for the Sunforger : Tithe to find our shocks and duals (Also can be used to tutor up Mistveil Plains ). Path to Exile because it is a great removal spell, Fork to copy your opponents fancy spells aswell as Boros Charm because it serves as boardwipe-protection and wincon-enabler at the same time. Other new additions: Torpor Orb because of Bane of Progress and the like... Winds of Change in case you don't like your hand. Idyllic Tutor because i love the art-design and you simply can't have enough tutors... Karmic Justice because we wan't to protect our stuff and punish our opponents if they wan't to do us harm... Wayfarer's Bauble because of early ramp. Pentad Prism and Sphere of the Suns for the same reason (they also serve as donation-targets). Darksteel Plate to protect the mother-goat herself! Arid Mesa because fetches are great... Mindslaver as the new wincon for this deck. I always wanted to try this card out! Perplexing Chimera + Homeward Path , Bitter Feud , Venser, the Sojourner , Howling Mine , Phyrexian Unlife , Mindmoil , Transcendence , Library of Leng , Capsize , Victory Chimes , Otherworld Atlas , Long-Term Plans , Austere Command , Grafdigger's Cage , Sea of Clouds , Mana Vault . Please note that I need to rework the deck-description due to all of the changes above but this will take some time. PS: I managed to obtain an altered full-art version of Zedruu the Greathearted so that she does lead the deck in a deserving design from now on! Folders Zedru, Zedruu, Liked decks, Cool Decks, Deck ideas, _Prototype!